The sleek, high-tech design of the turnstiles support EVRY’s brand positioning, and they provide a high-throughput, secure solution that meet EVRY’s demanding access requirements. As one of the largest IT companies in Scandinavia, EVRY provides comprehensive computing, IT consulting, and business solutions to Nordic companies, financial institutions, public sector entities, and health authorities. While security at EVRY facilities is paramount, so is maintaining a leadership brand and accommodating a high flow of staff and visitors. Entrances of EVRY facilities must provide a high level of security given the value and sensitivity of the work they do, as well as the presence of clients’ intellectual property and other data. Management was looking for entry designs that would not only provide a secure entry way, but would also display excellence in design, innovation and quality – elevating and supporting the overall perception of the firm for both staff and visitors. 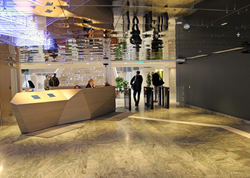 The EVRY security team quickly zeroed in on Boon Edam as a premium entrance provider. When they heard that many Boon Edam entrances could be customized to meet aesthetic objectives or to match desired colors and finishes, they were compelled to come and see the samples in person. Bravida, the system integrator who installed the Lifeline Speedlane Swing speed gates integrated them with cutting edge access control technology that communicated with security personnel. The combination of this physical and technological access control delivered a highly effective solution that met EVRY’s needs for both staff and visitor access control. The Lifeline Speedlane Swing speed gates are available in a wide selection of dimensional and glass choices to support a range of needs, such as higher security levels or disabled access. It features a slim form factor that creates an almost invisible gateway – instantly conveying an impression of sleek design that is reinforced by futuristic light pulses that guide user actions. Available in a range of colors and finishes, it can be customized to blend in or stand out, depending on the need for the installation.